These fun, fearless girls dared to face their fears, conquering the ocean and the treetops--and having a lot of fun! If you've picked up a copy of this month's Cosmopolitan Philippines with the ever-fab Lady Gaga on the cover, then you know that it's all about daring this July. We dared Cosmo chicks to face their fears--be it of the ocean or of heights. 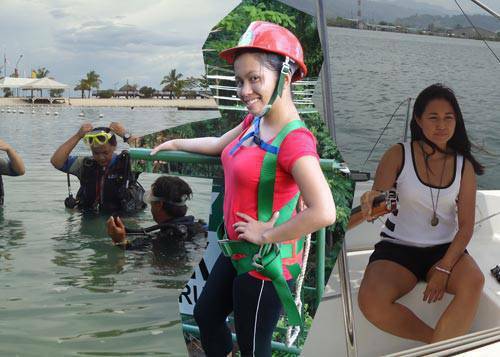 One of those lovely ladies was Tweetie de la Calzada, an adrenaline junkie who's always dared to try everything—except scuba diving. The deep ocean is an admittedly scary place and a little known part of the planet. Earth is 70% water, and much of it has never been explored. Maybe a fear of the deep factored into Tweetie's reluctance to dive in, but she gamely took Cosmo's challenge. She dared to dive. Another Cosmo chick, Sugar Perez, had a similar fear. She's always been afraid of sea creatures, which is why she rarely ever sets foot in the water. (She blames her brothers and movies like Jaws.) She dared to sail the open seas. Our Make Over Your Life campaign winner, Amie Perez, is deathly afraid of heights. Ever the Cosmo chick, though, she's never one to back down from a dare and challenge herself. Cosmo took her to Treetop Adventure in Subic Bay and had her in the air, far, far, far away from the ground. Amie dared to take a leap. These fab young women faced their biggest fears and had a great time doing it! Read all about the Cosmo Dares and each girl's experience in the July issue of Cosmopolitan Magazine, with Lady Gaga on the cover, in stands now!